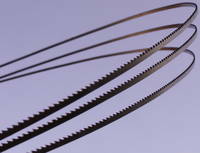 The high quality precision saw bands of the M-Series are best suited for half-hard materials like brass. The average tooth density of 18 teeth/inch is particularly suitable for a material thickness between 5 - 10 mm. The type 514 with 14 teeth/inch is particularly well suited for bigger dimensions and a high productivity.